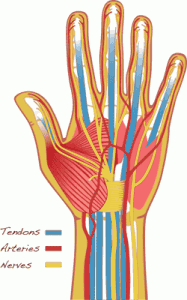 What Is My Tenosynovitis Claim Worth? The Tenosynovitis website provides information on the many aspects of the tenosynovitis condition ranging from what it is, what the different types of tenosynovitis are and what causes them, what the symptoms of tenosynovitis are, how the condition can be prevented, treated and what professions are particularly at risk of their employees developing tenosynovitis. Tenosynovitis is a condition that affects the tendons, specifically the sheath (synovium) that surrounds the tendons. Often it can be classified as a repetitive strain injury because the repetitive motions of a physical activity often brings about or exacerbates the condition, however, rarely tenosynovitis can be developed through infection of a cut or wound whereby the bacteria will travel to the nearest tendon and cause inflammation. There are variations of tenosynovitis such as De Quervain’s tenosynovitis which affects the thumb and stenosing tenosynovitis (sometimes called Trigger Finger) which usually affects either the middle finger, fourth finger or the thumb). Symptoms are synonymous across the different types of tenosynovitis in that the sufferer will usually feel pain, stiffness, aching, swelling and a dysfunction of the area which includes the inability to straighten the affected area or a loss of grip or strength. Tenosynovitis is a common condition, particularly amongst middle aged people with the vast majority of sufferers being women. There are a wide range of treatments available and there is a good chance of complete recovery from tenosynovitis if the condition is caught early enough and treatment is followed.